Humanitarian agencies have renewed support after a rare moment of unity in the UN Security Council regarding cross-border aid delivery into Syria, but face only growing challenges and ethical dilemmas navigating the country's complex conflict lines. New action by the UN Security Council on humanitarian access to Syria contains some welcome advances while underlining the difficulties facing aid workers, whose duties have been constrained by the three-year deadlock in the Council and deliberate impediments on the ground. Most saliently, the latest resolution permits cross-border aid delivery into Syria, which may go some way towards enabling the UN and other humanitarian actors to provide aid to civilians in currently inaccessible areas. The imperative for new action by the Council was clear. According to a UN report from earlier this year, almost a quarter million Syrians are under siege, and according to more recent figures, 4.7 million are in difficult to access locales, and 10.8 million need aid. The UN and NGOs are conducting lifesaving operations to reach civilians in need. Yet despite a Security Council Resolution adopted unanimously in February 2014 demanding unhindered access for the UN and its partners, both government and nongovernmental forces have since inhibited access. Assad has repeatedly refused to implement the terms of the February resolution, and UN Member States have had little recourse to force him to do so, given that it was passed outside the provisions of Chapter VII of the UN Charter, which could have threatened sanctions or force in the event of non-compliance. The same risk remains with the new resolution. In this environment, UN agencies and NGOs involved in relief efforts face an unenviable choice. Either they can comply with Assad’s demands, and thereby unwittingly support his war aims. Or, alternatively, they can defy the regime and risk the consequences, which may include being barred from accessing government-held areas. Already, the Syrian government has forced Mercy Corps, one of the largest aid groups, to close operations in Damascus as a consequence of their provision of aid to individuals in opposition controlled areas. In other parts of the country, aid agencies have also had to confront the rapid rise of the jihadist group ISIS, which controls swathes of Syria and Iraq, offering an equally unfathomable dilemma. 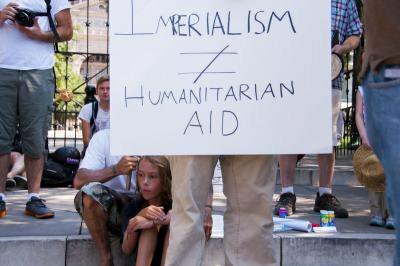 If aid agencies provide relief to civilians under ISIS’s control, that group (and similar ones) is given a free hand to funnel its resources towards its war aims, rather than funding services to provide food, water and basic healthcare. The terms of the new resolution may mean that this dilemma becomes more acute more quickly, given that ISIS controls a number of the border crossings through which the Security Council has granted access. Not only could the group attach its own conditions to aid delivery and threaten the safety of humanitarian workers, but also cooperating with ISIS could leave international aid organizations subject to prosecution under the anti-terrorist laws by major donors. Can the operational principles of neutrality, independence and impartiality shield humanitarian agencies and actors from criticism? Kambize Shabankare/Demotix. All rights reserved. The new resolution–which mandates that the Syrian government be informed about cross-border operations, but have no right to veto them­–therefore constitutes progress. Nevertheless, aid agencies are right to caution that the Council must take care not to set a counter-productive precedent by suggesting that the legality of cross-border operations is dependent on UN Security Council authorization. To ensure that the new resolution does not quickly become an irrelevance, as its predecessor did, there is more that states and humanitarians can do, even if Chapter VII enforcement mechanisms (such as the sanctions western countries wanted to include in the resolution) remain out of reach. Independent of the Security Council, donors could funnel more resources to NGOs that can reach some of the areas Assad is prohibiting the UN from reaching, as John Kerry said the US may do. The UN could provide aid in areas under Assad’s control and willing NGOs could (continue to) work in areas controlled by opposition groups, including with funding channeled through UN agencies, a simpler proposition if the UN stops eschewing support for cross-border missions. International donors should take care to make sure that their anti-terrorism laws strike a balance between national security and a common-sense approach towards dealing with actors on the ground who control access to civilians in need. This would not wholly solve the dilemma because, given the horrific record of humanitarian access, some restrictions will presumably endure, especially in areas contested by government and rebel forces. Some might object that this division of labor violates the principle of neutrality of aid organizations, or that in taking account of the realities on the ground, the UN risks complicity with a criminal regime. Other actors will hopefully one day address the crimes committed by both sides in Syria. Humanitarian actors, though, must concern themselves only with reaching the greatest number of civilians in need–in both government and opposition controlled areas–taking account of the highly politicized situation, while continuing to do their best to uphold the Humanitarian Principles of neutrality, impartiality, humanity and independence. Given the tragedy in Syria, this strategy may be the best among bad choices. An earlier version of this blog appeared on the website of The Hague Institute. Thanks to Scott Wisor for helpful feedback on an earlier draft.